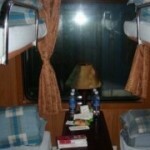 Sapaly Express Train is a luxurious and convenient train service that is provided by Sapaly Hotel since April 2010. 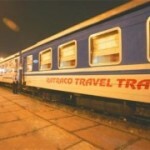 This service is offered to the guests of this hotel on two special carriages on SP3 and SP4 trains which run in “The Golden Hour” on railway route between Hanoi and Sapa. 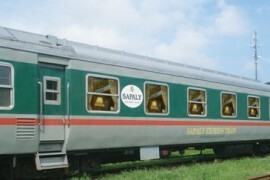 The Sapaly Train carriages are truly a smaller duplication of Sapaly Hotels which have been greatly invested to attain the standard of 3-star hotel’s rooms on land. 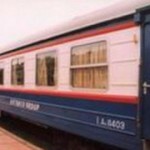 Each carriage was rearranged into 6 cabins instead of 7 like normal express trains and decorated with deluxe natural wooden furniture and amenities. There are two to four beds on each cabin with high quality pillows and blankets which are replaced after each train to guarantee the cleanness, and facilities such as TV, reading lights and speaker are also equipped to those cabins to ensure the most comfortable atmosphere to the guests. Furthermore, the excellent services on Sapaly Express train is another outstanding factor of train because of the brilliant staffs and convenient extra bar service on the train.